Watch the Big Game or enjoy a movie night with friends on this cozy 3 pc. sectional. With a lengthy chaise lounge on its left, a 3-seat sofa on its right, and an armless loveseat in between, this sectional has plenty of room for your favorite company. Soft track arms and block wood feet exude a relaxed, contemporary style, while plush, weltless cushions and decorative throw pillows offer durable comfort and support. Furnish your family room or entertainment area with this warm and inviting sectional. The Bryant Contemporary 3 pc. Sectional Sofa with LAF Chaise by Flexsteel at AHFA in the area. Product availability may vary. Contact us for the most current availability on this product. 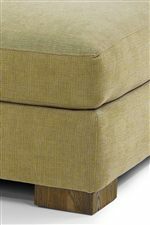 7399-34 RAF Corner Sofa 1 95" 38" 35"
7399-25 LAF Chaise 1 34" 68" 35"
7399-29 Armless Loveseat 1 50" 38" 35"
A welcome addition to any lounge area, the Bryant upholstery collection offers a casual yet contemporary style, with the lasting comfort you need for your family and friends. Complete with a matching sofa, loveseat, chair, ottoman and sectional, this group has all you need and more to create a warm and inviting setting. Marked by soft track arms and block wood feet, each piece in this collection is striking yet soothing. Plush, weltless cushions and decorative throw pillows create soft and supportive seats, while lengthy chaises and a versatile ottoman cater to your convenience as well. Sit back, relax and enjoy the alluring look and feel of the Bryant collection. 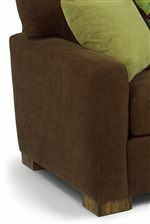 The Bryant collection is a great option if you are looking for Contemporary furniture in the area. Browse other items in the Bryant collection from AHFA in the area.